The treatment of drug resistant TB has always been more difficult than the treatment of drug susceptible TB. It has required the use of reserve or second line drugs that are more costly and cause the patient more side effects. Also the drugs must be taken for up to two years. The following is the type of problem that patients taking the drugs were and indeed are still faced with. And so the search began for shorter regimens for the treatment of drug resistant TB. It was believed that shorter regimens would be easier to take. This led to the development of the Bangladesh regimen which appears to have much higher TB cure rates and the drugs only need to be taken for eight or nine months. There are also other shorter regimens that are now being tested. The results of randomised control trials of these new regimens, are only just now starting to be available. Even when patients can take the Bangladesh regimen it does not solve all the problems. It still requires patients to have injections as part of their TB treatment. For some patients these can be extremely painful and difficult as Zolelwa Sifumba explains below. The pain lasts after the patient walks out of the doctor’s room. Not every patient will suffer in this way, but the fact that some do, means that the search must continue for shorter TB treatments for the treatment of drug resistant TB that don’t involve this type of injectable drug. Fortunately it is no longer recommended by the World Health Organisation (WHO) from December 2018 3"WHO treatment guidelines for drug resistant tuberculosis (2018 update)", WHO, Geneva, 2018 https://www.who.int/tb/features_archive/updated-treatment-guidelines-multigrug-rifampicin-resistant-TB/en/ that patients on longer regimens have injectable drugs. It may be that some patients will in future need to choose between having a shorter regimen which involves injectable drugs, and a longer regimen which doesn't. Fewer drugs are needed when the treatment of drug resistant TB is with a shorter TB drug regimen. Not all patients with drug resistant TB are eligible for treatment with a shorter regimen. A shorter regimen is usually considered suitable for patients with rifampicin resistant or multi drug resistant TB who have not been previously treated with second line drugs. They also need to be patients in whom resistance to the fluoroquinolones group of drugs and second line injectable drugs has been excluded or is considered highly unlikely. There needs to be a careful selection of patients to be enrolled in any shorter regimen. There also needs to be effective patient support to enable full adherence to treatment. It is recommended that patients are tested for susceptibility or resistance to fluoroquinolones and to the second line injectable agents used in the regimen before starting on a shorter MDR-TB regimen. Patients with strains resistant to any of the two groups of medicines should be transferred to treatment with a conventional MDR-TB regimen. This is to ensure that patients are not being treated with drugs that they are already resistant to. The availability of rapid and reliable TB tests can be very valuable in deciding within a few days which patients are eligible for shorter MDR TB regimens. It can also provide information about what modifications to conventional MDR-TB regimens are necessary based on the resistance detected. The Line Probe Assay test can be used as an initial direct test, rather than tests such as the culture test to detect resistance to fluoroquinolones and to the second line injectable drugs. In settings where drug susceptibility testing (DST) for fluoroquinolones and injectable drugs is not yet available, treatment decisions need to be guided by the likelihood of resistance to these medicines. This needs to take into account the patient’s clinical history and recent surveillance data. In May 2016 (and again in December 2018) the WHO changed their recommendations on the use of TB drugs for the treatment of drug resistant TB.4"WHO treatment guidelines for drug-resistant tuberculosis (2016 update)", http://www.who.int/tb/areas-of-work/drug-resistant-tb/treatment/resources/en/ 5"WHO treatment guidelines for drug resistant tuberculosis (2018 update)", WHO, Geneva, 2018 https://www.who.int/tb/features_archive/updated-treatment-guidelines-multigrug-rifampicin-resistant-TB/en/ This was partly because of the Bangladesh regimen, which appeared to show that a shorter regimen could be just as successful as a longer regimen. 6Van Deun, A et.al. "Short, highly effective and inexpensive standardized treatment of multidrug-resistant tuberculosis", Am J Respir Crit Care Med 2010; 182:684-692 http://www.atsjournals.org/doi/full/10.1164/rccm.201001-0077OC. There had also been a number of other studies which had shown a similar result. There had however been no randomized control trial, but WHO decided that the treatment of MDR-TB was too important for there not to be new recommendations. The recommendations also cover the use of bedaquiline and delamanid which are starting to be used for the treatment of drug resistant TB. A longer treatment regimen for any patient with rifampicin resistant TB is always going to be complicated. A number of different second line drugs need to be used on the basis of the drugs that the patient is already known, or likely to be resistant to. The page on second line drugs show the various groups that WHO puts the drugs in, groups A, B, & C.
The new recommendations cover rifampicin resistant forms of TB, including patients with strains susceptible to isoniazid, or with additional resistance to isoniazid (i.e. multi drug resistant TB (MDR-TB)). It also includes patients with strains also resistant to other medicines from the first line group (poly-resistant) or from the second line group (e.g. extremely drug resistant TB (XDR-TB)). Injectable agents are no longer among the priority medicines to be used when designing longer regimens, and WHO recommmends that patients should receive all oral regimens. Kanamycin and capreomycin are not recommended any more. Three drugs, fluoroquinolones (levofloxacin or moxifloacin), bedaquiline and linezolid are strongly recommended to be in a longer regimen which is completed with other drugs ranked by a relative balance of benefits to harm. Most regimens need to include at least four drugs likely to be effective in the first 6 months and three for the rest of the regimen. The proposed total length of longer MDR-TB regimens is about 18 - 20 months depending upon patient response. Monitoring MDR-TB regimen with monthly culture rather than sputum microscopy alone is said to provide the best option for detecting a failing regimen in time for corrective action. 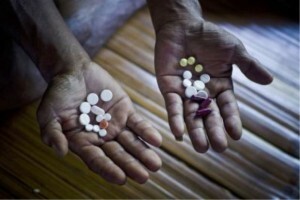 Generally in MDR/RR-TB patients on longer regimens, all three Group A agents and at least one group B agent should be included to ensure that treatment starts with at least four TB agents likely to be effective and that at least three agents are included for the rest of treatment after bedaquiline is stopped. If only one or two Group A agents are used both Group B agents should be included. If the regimen cannot be composed with agents from Groups A and B alone, Group C agents should be added to complete it. The WHO does say that the cost of the new recommendations and the need for extra resources for additional monitoring may limit the uptake of the new recommendations. All of the agents are available via the Global Drug Facility, but there may still be issues regarding the supply of drugs such as bedaquiline and delamanid. Surgery for the treatment of drug resistant TB is now recommended in some circumstances. In patients with RR-TB or MDR-TB elective partial lung resection (lobectomy or wedge resection) may be used alongside a recommended MDR-TB regimen.